The Saucer or what I have commonly heard called a Tulip magnolia is one of my favorite small trees. Some varieties are small enough to be considered a shrub. It is an early bloomer along with the redbuds here in Houston. We start seeing them near the end of winter. In colder zones they wait till mid-spring to bloom. My dear husband knew I wanted one of these lovely small trees. And so he saved one that was being removed in a garden redo. The leafless gray branches become covered in large luscious pink blooms of 6 petals in a shape similar to a tulip in early March. As the leaves appear the flowers open into a saucer shape. It is quite eye catching in the still cold days where much of the landscape is still resting. A couple of week after they are in full bloom the petals drop off leaving a carpet of pale pink. By then the tree are covered in soft green elongated oval leaves. There are several varieties and they range in growth habits from 10-20 feet with a similar spread. It makes a fine specimen tree especially in a home with a small yard if you don’t mind that it only shows off at the end of winter. I find it exciting and totally worth the wait. I planted mine where I can see it from the window where I write. Tulip magnolia flowers on bare gray branches. Being deciduous it is cold hardy. It tolerates light shade to full sun. Preferring morning sun and best with protection from the heat of the late afternoon. If it is planted in all day full sun it will need to be more heavily mulched and the soil kept evenly moist; otherwise it might flower before the last frost. It does fine in our heavy clay soil. But it prefers the soil to be rich with plenty of organic matter and well-drained. I have mine in a bed with plants of similar needs with it’s own shady wet micro-climate. We use organic fertilizer, shredded hardwood mulch and seaweed extract to keep the more heat sensitive plants happy. 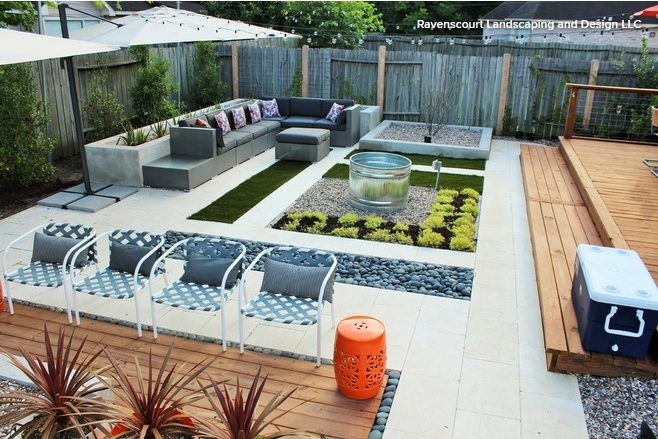 It is reported to be mildly drought tolerant but it will need regular watering. When frost comes late, like we had this year it can ruin the flowers. I only saw minimal damage in our neighborhood where these lovely trees are quite popular. 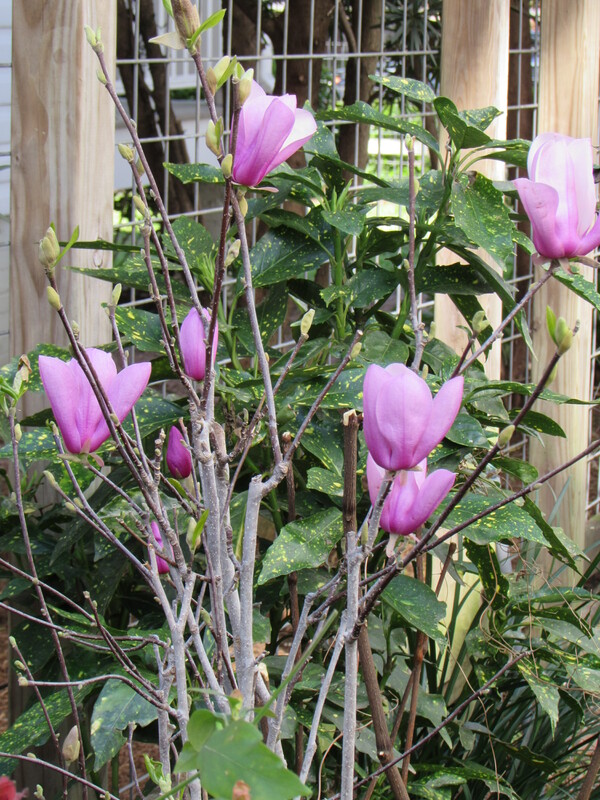 The Tulip or Saucer magnolia is a hybrid of the M. heptapeta and the M. liliiflora M. heptapeta and M. liliiflora both native to Japan. And a couple of week after they are in full bloom the petals drop off leaving a carpet of pail pink. Here is our little transplanted Tulip magnolia we saved from a rip out. 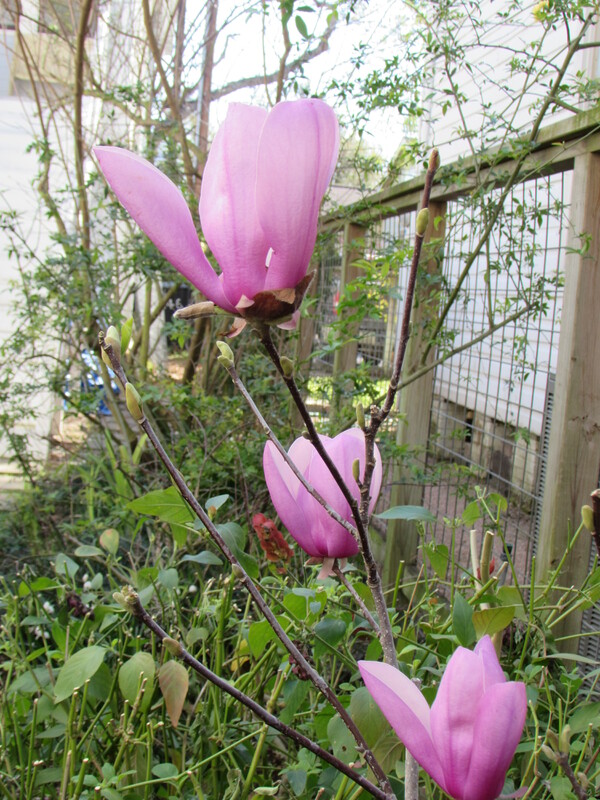 Here is a photograph I took over the fence of my neighbors beautiful Tulip magnolia under a large cypress tree. I have been enjoying it for years. I think this will make a nice photo to use on a card. What a beautiful plant! I love magnolias, but there isn’t really room in my small wildlife garden. 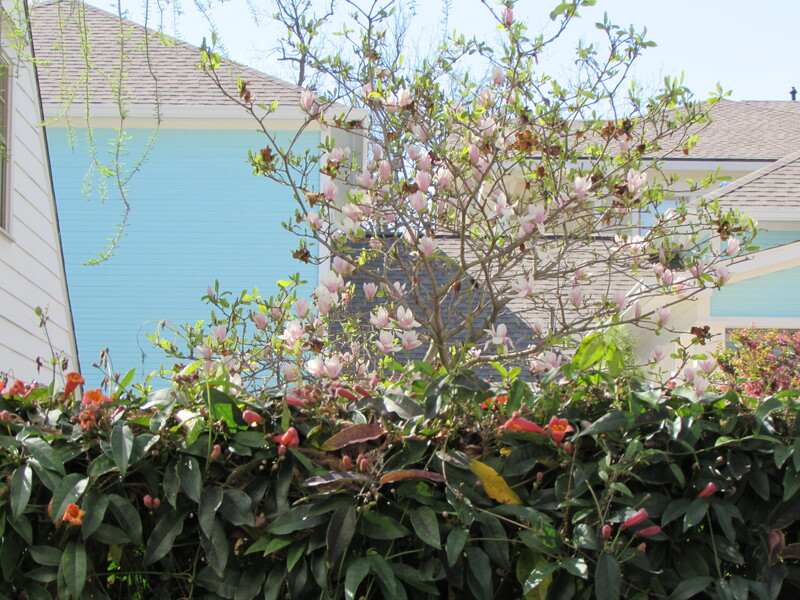 Instead, I just admire the magnolias that everyone else has planted. 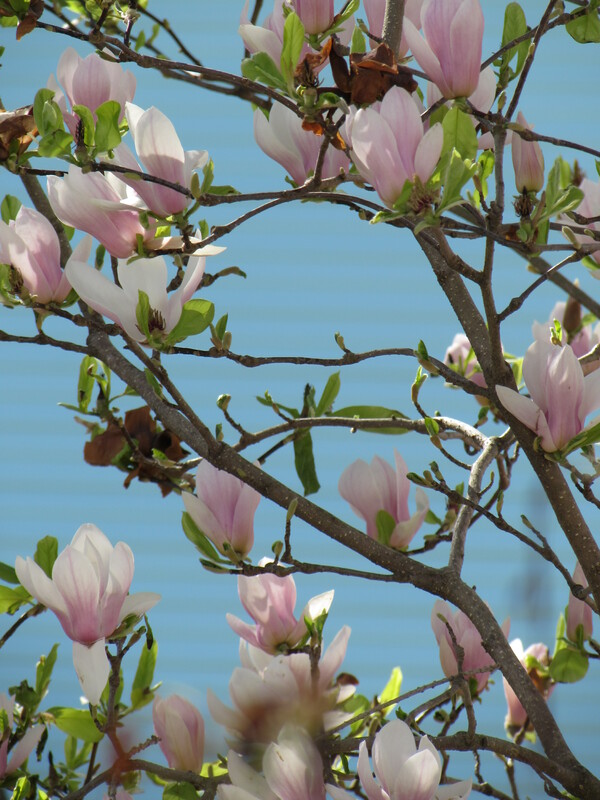 The magnolia flowers against the blue sky would make a stunning card, I agree…. 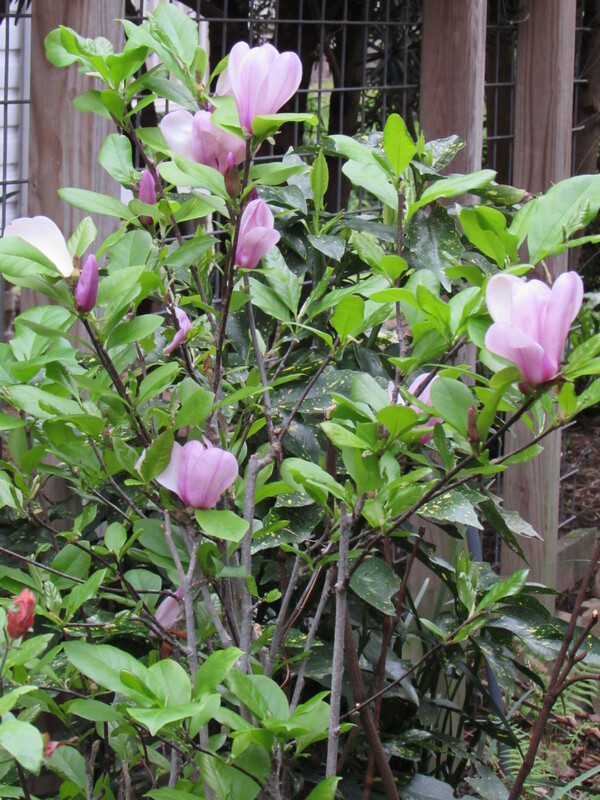 Thank you….I do love the big majestic magnolias and even this wee one needs 6 to 8 feet space. Laurin, for many reasons I am happy you write this blog. 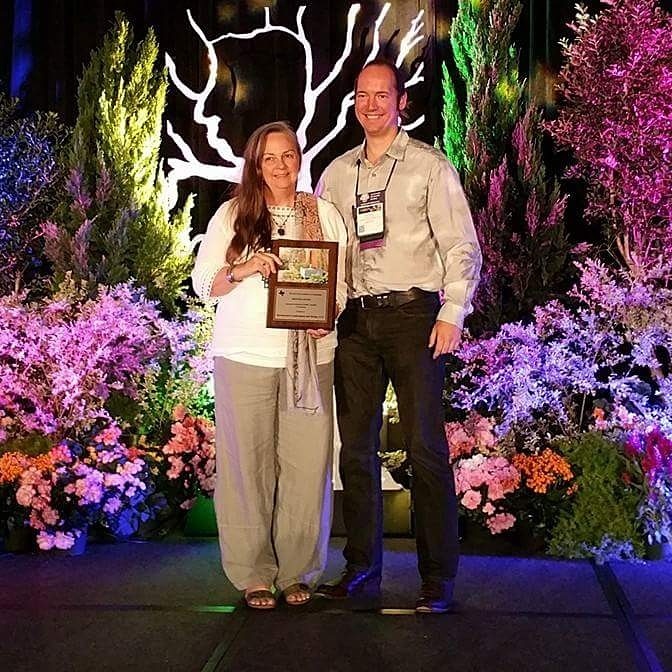 I enjoy gardens more because of what I am learning here. This spring is especially fun. 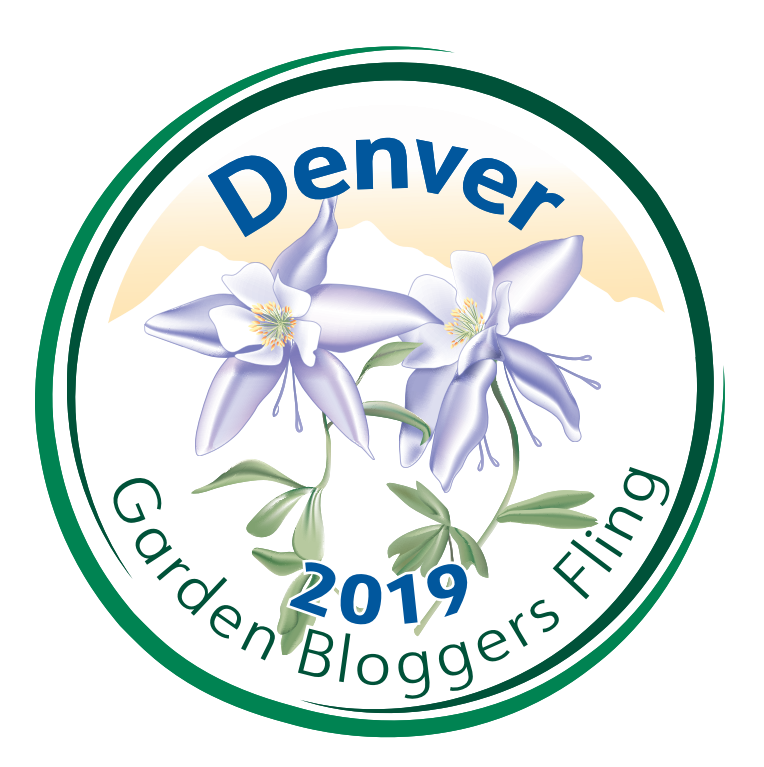 The weather is great and your garden is filled with glorious blooms! Lucky me to enjoy such beauty by glimpses through the fence! Your photos are lovely! Thank you!